Recently Governor of Reserve Bank of India (RBI), Mr. Raghuram Rajan, mentioned his fears that global markets are on the verge of another market crash (Link). His statement made an investor like me, who has all his savings in equity markets, feel jitters. Therefore, I tried to do an analysis of current valuation levels of Indian equity markets to see if such fears are real. This article is not about passing a judgment on Mr. Rajan’s statement. However, it is a simple guide for individual investors like me to have a benchmark to decide about the valuation levels of equity markets so that we may not depend on the RBI Governor to caution us every time equity markets become overvalued. We should be able to make up our own judgements about equity market valuations. It is said that equity markets of a country reflect the general economic condition of that country. Moreover, the market indices (e.g. Nifty and Sensex) become an indicator of valuation of country’s assets. However, there are many thoughts favouring this concept and many against it. Some people say that the market index reflects only investor sentiments at the moment as the market index fluctuates wildly without significant change in ground realities. Others say that market index reflects values of underlying best stocks of a country and index increases only when value of underlying stocks increase indicating that the actual value of all the assets is going up. None of these thoughts is completely true or false. Market indices reflect investor sentiments as well as actual asset values.However, any interpretation of indices levels should be taken with a pinch of salt. With these thoughts in the background, we move ahead to discover about the valuation of equity markets and decide whether equity markets are over, reasonable or undervalued at any point of time. Market indices (Nifty & Sensex) values are regularly updated and shown by respective stock exchanges: BSE and NSE. These stock exchanges also provide other related indices data, which we would analyse to decide about current valuation status of Indian equity markets. This data comprises of Price to Earnings ratio (P/E ratio), Price to Book Value ratio (P/B ratio) and Dividend Yield (DY). Price to Earnings ratio (P/E ratio): P/E ratio indicates the price one pays to buy Rs. 1 of earnings per year of any company. If P/E is 10, it means that to get Rs. 1 of earnings in one year from a company, one is paying Rs. 10. Similarly, if P/E is 20, it means that to get Rs. 1 of earnings in one year from a company, one is paying Rs. 20. Comparing P/E ratio of 10 and 20, in above example, it would become clear that at P/E of 20, one is paying more money to get same value of Rs. 1 in earnings than when P/E is 10. Price to Book Value ratio (P/B ratio): P/B ratio indicates the price one pays to get Rs. 1 of assets of a company at book value. P/B ratio of 1 means that one is paying exactly the money that the asset is in company’s records. P/B ratio of 2 means that one is paying double the amount that the assets is in company’s records. Higher book values mean costlier valuations of the company. Dividend Yield (DY): DY is a measurement of dividend paid by a stock compared to its market price (DY = dividend paid/current market price). If a stock whose current market price is Rs. 100 and it pays a dividend of Rs. 2 per share in a year, then its DY is 2%. One can relate DY to rental yield of a residential property. If annual rental income is Rs. 2 lac from a flat, which has a value of Rs. 1 crore, then rental yield of that flat is 2%. High yields, whether dividend or rental, mean that share/flat prices are cheaper and low yields mean that share/flat prices are costlier. P/E ratio, P/B ratio and DY of market index (Nifty or Sensex) is derived by considering earnings/book value/dividend yield of all the constituent shares of index and then comparing it to the current index value. Why do we prefer P/E ratio? Book Value in P/B ratio is an accounting concept and is different from current market value/replaceable value of company’s assets. Market Value is price, which one pays to buy a similar asset today in market whereas Book Value is the value on which any asset, bought in past by the company, is shown in company’s records today. Book value keeps changing to adjust for the wear & tear/oldness of any asset. The annual decrease in book value is called Depreciation. There are many rules in accounting to decide depreciation and arrive at book value of any asset. The Book Value arrived after using accounting rules may or may not show the current market/replaceable value of company’s assets. Therefore, I do not like to use Price to Book Value ratio (P/B ratio) as a valuation indicator. Dividend Yield (DY) depends on the dividend declared by the company’s management. Management can change dividend amount because of many reasons, which might not be related to current economic situation. For example, the promoter who owns 75% stake in the company, wants to close a personal loan taken by him. He can influence the board of directors to declare big dividend so that he gets sufficient money as dividend to repay his personal loan. Using dividend yield (DY) as a valuation criteria exposes one’s analysis to get impacted by many such frivolous factors. Earnings in P/E ratio, is the amount of profits, which a company makes in a year divided by total number of shares of that company. Earnings value of market index is arrived by adding earnings of each of its constituent stocks. Earnings are declared by companies quarterly and are put under intense scrutiny by their auditors, tax officials, analysts etc. Moreover, the companies, which are part of market indices, are mostly very big and reputed companies of that country. Therefore, even though, there are instances of promoters of companies fabricating earnings data, still earnings is the most appropriate parameter out of the three (earnings, book value and dividend yield) to analyse valuation. Whenever the P/E ratio exceeds 20, the markets starts fluctuating wildly and is mostly followed by a big decline, as seen in 2000 (technology bubble) 2004 (fall of NDA government), 2009 (global meltdown after US subprime crisis) and in 2011. Moreover, whenever P/E ratio of index crosses 24, very big declines in equity markets follow, which are often called bloodbaths. Markets are the most stable in 16-20 P/E range. Whenever the valuations increase beyond 20, there are market declines until the time P/E comes back to 16-20. Moreover, whenever the valuations go below 16, market shows recovery and comes back to 16-20 P/E levels. Whenever the P/E ratio nears 12 or goes below 12, the market shows a sharp recovery, as seen in 1999, 2001, 2003, 2004 and 2009. These are wonderful times for investors to buy stocks, as almost all the stocks are available at dirt-cheap valuations. One can earn huge profits if she is able to hold on to her nerves in such a declining equity market and keep on investing with discipline. At May 16, 2014, when results of general elections were declared, P/E ratio of Nifty touched 19.93 and since then, it is continuously above levels of 20. It is currently at the border between fair and over valuations. For markets to show sustained healthy price increase from current levels, it is necessary that earnings of Indian companies increase, which would bring the P/E ratio of market index down to fair valuation levels. It is no longer an option for Indian government but has become mandatory to push for business friendly policies to help companies grow and increase earnings. If business environment is not improved, it is very likely that the current euphoria of investors might take market valuations to overvalued and dangerously overvalued levels, which can lead to big crash, as was witnessed in 2000 and 2008. Therefore, it is not without reason that our admirable RBI Governor, Mr. Rajan, has fears of another market crash. Let us pray that the current government. is able to push the much-needed reforms like labour reforms, liberalized investment policies, simple & transparent approval processes etc. so that the ease of doing business is improved and India returns to a healthy growth path. Until then we should keep our fingers crossed! 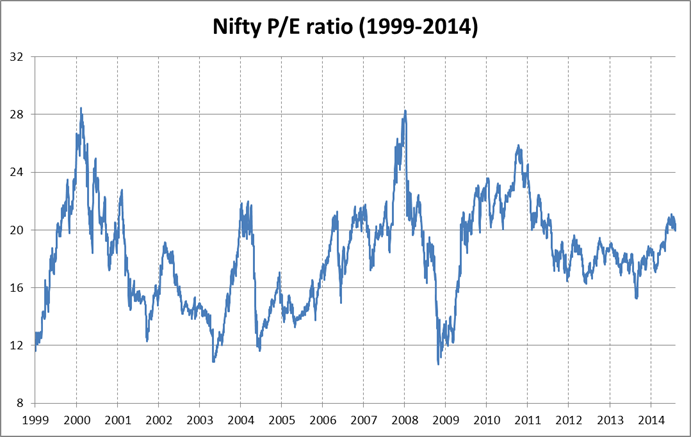 Please tell, what you think about current valuation levels of Indian equity markets. PrevPrevious ArticleYou should always invest in Direct Plans of Mutual Funds. Here is the reason why?